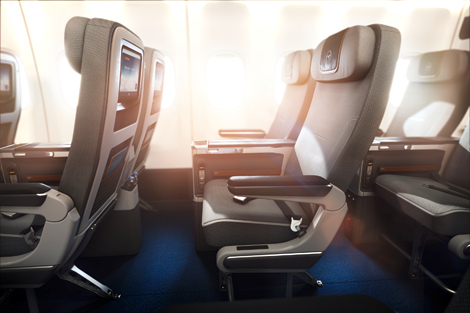 Lufthansa introduced its B747-8 premium economy product on November 22 last year, nine days earlier than scheduled. The carrier is retrofitting all its long-haul aircraft, including its A380s, A340s and A330s, which it expects to complete by this October. I arrived at the check-in counter at 2135. As there are no separate counters for premium economy passengers, I checked in at an economy counter. Premium economy passengers are allowed to check in two pieces of luggage weighing up to 23kg each. My flight, LH797, was parked at Gate 66. I arrived there at around 2230. Boarding time was 2250. Premium economy passengers queued in the same line as economy passengers and the boarding process was smooth. My seat was 22D. Once boarding was completed, I was offered mango juice or water as a welcome drink. This aircraft has 32 premium economy seats, arranged in a 2-4-2 configuration. The premium economy class is sandwiched between two economy sections. Lufthansa had intended to put the premium economy segment at the front, but space was inadequate. The first four rows of economy seats will be changed to business seats. Each passenger received an amenity kit (with toothbrush, toothpaste, socks, eyeshades and earplugs) placed in a compartment in the armrest. A bottle of water, slippers and earphones were stored in a net bag at the front of the seat, while a pillow and blanket were placed on the seat as we arrived. The tray table is also stored in the armrest, where the earphone socket is situated. Under the screen is a USB port and under the armrest there is a power outlet. Seats A-C and H-K on row 22 are best if you want more legroom, but as the lavatory is shared with economy passengers, queues for the toilet could be bothersome. I don’t recommend seats D-E-F-G on row 22 because there is a divider in front of the lavatories that limits leg space. Rows 23 to 25 may be better options. Pushing back at 2340, the flight took off at 0000. The in-flight entertainment system was already functioning when we boarded, which was a nice touch. Drinks included juices and wines, which were served after the seatbelt sign was turned off. Shortly after, dinner was served. I was surprised when the cabin crew gave me an economy menu, but Lufthansa explained most of the main dishes are identical to the economy class menu, but that the portions are a little bigger, and the salad and dessert are different. The starter was potato salad with salmon; the main was either pork goulash with penne, pesto and broccoli, or sweet-and-sour chicken with rice and vegetables; dessert was banana bread-and-butter pudding. The food was served in chinaware. Everything had been prepared well. The main dish – I settled on the sweet and sour chicken – was tasty. The flight offered wifi at a charge of US$1.60 for 10 minutes, but the service was unavailable when flying over China. Though not very big, the table was wide enough for a laptop. After around 30 minutes, I went to sleep. The seat was comfortable and I slept well for four to five hours. The lights were off for around eight hours. At 0345 German local time, the lights were switched on for breakfast, which consisted of bacon, corn and tomato fried rice or scrambled egg with chicken sausage and Lyonnaise potatoes. I was impressed by the size of the portion. We landed on time at 0500. The gate was quite far from immigration. It took some 20 minutes to disembark and reach the queue at the immigration counter. This route’s schedule is great as passengers arrive early in the morning. The B747-8 provided a quiet environment and the seat was comfortable enough to sleep in, though the divider in front of the lavatories limited my legroom. Service was good and the crew members were polite. It was an excellent flight. PRICE Internet rates for a midweek return premium economy flight from Hong Kong to Frankfurt in June start at HK$18,437 (US$2,378), including taxes and surcharges.